During the summer of 2017, a youth leadership program gave a cohort of Chicago teens a safe and nurturing environment to learn lessons that enriched their lives, as well as the neighborhood where they lived. Teens in the “I Can Fly” Youth Leadership Program focused on the richness of the soil, not the economic poverty around them; the sweet fruits of labor, not the bitterness of systemic discrimination. They learned art — culinary and fine – as well as the art of negotiation, compromise and hard work. They learned to trust in their own leadership power as well as a higher power. The program was punctuated by a rich Speaker Series and four engaging field trips, but mainly the teens learned about these issues while building butterfly habitat, staking tomato plants, and pulling herbs and greens for alfresco lunches in the garden. The program participants lived in the Austin neighborhood on Chicago’s West Side, which is rich in people and resources: gorgeous Columbus Park, strong community groups, an active religious community, affordable homes and apartments, and a vibrant African American culture. “We always hear that bullets are flying in Austin. I wanted to focus on something other than bullets,” said Doris Davenport, program manager for I Can Fly. 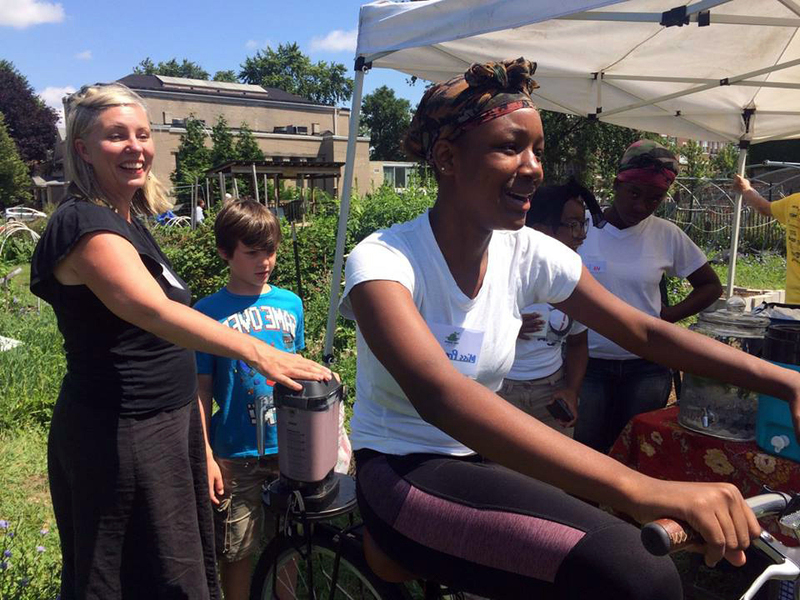 I Can Fly youth used energy generated by the blender bike to make smoothies with Cheryl Munoz of Sugar Beet Schoolhouse. The program launched with a kickoff screening of “Can You Dig This?”, an audience favorite at One Earth Film Festival. The event included rich post-film discussion of the film’s portrayal of urban agriculture renaissance in Los Angeles’ Compton community and what that might look like in Austin. Community-building expert Susan Lucci coordinated an incredible culminating trip to see Van Jones’ We Rise Tour at the Chicago Theater. “I Can Fly” summer youth cohort with mentors in the Harambee Garden.